•Measurement and Calibration: From 20-sim 4C you can export C-code that will operate and read sensors. •Machine Control: With 20-sim 4C you can export code to external targets to control the operation of machines. In 20-sim 4C you can start and stop the controller and change parameters during run-time. •Rapid Prototyping: By generating C-code automatically from external programs like 20-sim, a rapid cycle of designing (20-sim), generating code (20-sim) and testing (20-sim 4C) can be performed. 20-sim 4C helps you to get 20-sim models running as C-code on real-time processors. •Sources: 20-sim 4C will accept handwritten C-code and automatically generated C-code from external programs like 20-sim. •Targets: With 20-sim 4C you can run code on any target that runs a RTAI Linux operating system like PC's, PC/104 boards and ARM processors. 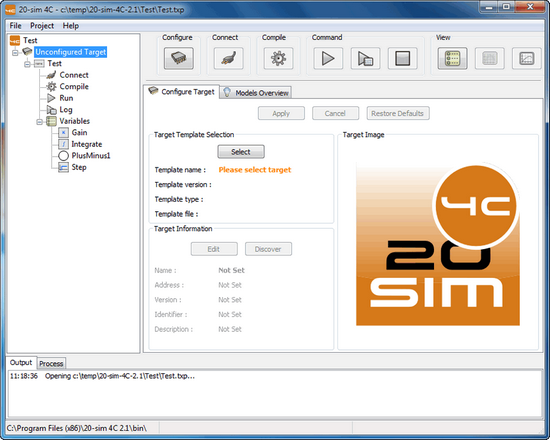 •20-sim: Any 20-sim model can be exported to C-code and imported in 20-sim 4C. •Command: From 20-sim 4C you can start and stop running code on a target processor. During run-time you can change parameter values. •Monitoring and Logging: In 20-sim 4C you can monitor and log every variable that is available on the target. Values are transmitted from the target to 20-sim 4C in real-time with sample rates up-to 100 Hz or off-line with the full sample rates up to 50 kHz. •Communication: 20-sim 4C runs on a Windows PC. Communication between 20-sim 4C and a target is performed through ethernet using the TCP/IP protocol. •Speed: Sample rates up to 50 kHz can be achieved, depending on the type of processor and the used I/O hardware.